“THE MOVE” is done! About 4000 orchids (really just 852 unless you count the babies) have made the 458 mile trip south. There are many tricks to successfully moving a collection learned over the years, but each time I move my greenhouse and orchids there are some new lessons, too. It does not matter if you are moving your orchids across the country or across town; the only difference is the time it takes to move. The first trick is to avoid disease. When orchids are moved roots are damaged, leaves cracked, and blooms broken. Before making any move, do your best to eliminate any scale or rots in your collection. This may include isolating infected plants if there is not enough time to complete the treatment. Treatment with an antibiotic/antifungal agent is also a good idea. Kocide is an old fashioned, but very effective copper-based, general fungicide and antibiotic that I like because it coats leaves blue. For my purpose, that is ideal because I can tell that each plant has been treated. Treat a few days ahead of time to avoid any toxicity problems that might arise from handling your orchids. Check the product label to be sure of handling and re-entry time. It is also ideal to move your orchids after you have allowed them to dry thoroughly, even more than normal. Your orchids may seem unhappy to be so dry, but this, along with the Kocide tends to limit the rots that turn up when orchids are packed tightly. 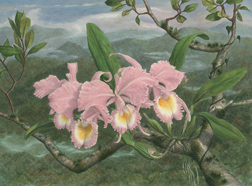 In “Nature” orchids survive droughts just fine and will quickly re-hydrate once they are back in your new growing area. During this time of year, orchids are in a growth mode, which means new growths and roots. There will be some inevitable damage, but this can be lessened by good planning. Plastic shipping containers can be purchased for any pot size. This commercial product is used by commercial nurseries to move plants in flower and bid and allow a nice space between plants. A piece of open newspaper over the pot opening before dropping in the pot will provide a physical barrier between plants, preventing possible transfer of bacteria and fungi from plant to plant. Roots will inevitably be damaged, allowing fluid to be transferred to other damaged roots. This is a prime way that viruses hiding in you collection are transmitted. If you are transporting your orchids by car or truck pay careful attention to temperature. In winter, it is a good idea to move during the day and in summer at night. Most garden stores sell remote digital thermometers used to remotely monitor you greenhouse temperature. These work equally well in a truck or in the trunk of a car, allowing you to assess any temperature extremes during the trip. No matter how successful your growing was before, a new location will require some adaptation. New water sources may require a change in fertilizer or even media. Light will be the first problem. Once you have your orchids in their new location, carefully examine the light. It is a good idea to provide less light than you had before, at least initially. Not every leaf on every plant in the old location was exposed to ambient light because some were shaded by other plants. Those leaves are subject to burning at the new site. Place your orchids in their new home, but wait a day or so before watering. Let the wounded roots and leaves heal. Any obvious damaged tissues should be removed and treated with cinnamon powder or hydrogen peroxide. Once wounds have healed a day, re-hydrate your orchids thoroughly. After another week, reapply a light treatment of your chosen fungicide/antibiotic. Pay careful attention to your orchids for a couple of weeks to be sure no other problems arise.